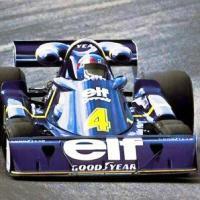 According to Derek Gardner, the man behind the P34’s revolutionary design concept, Jackie Stewart had a “fit of choking” when, on a flight home from the 1975 South African Grand Prix, the designer snuck into the first class section of the plane and informed the retired three-time world champion of his outlandish plans for Tyrrell’s next challenger. But what had convinced Gardner to think so radically? Put simply: F1’s increasingly level playing field. 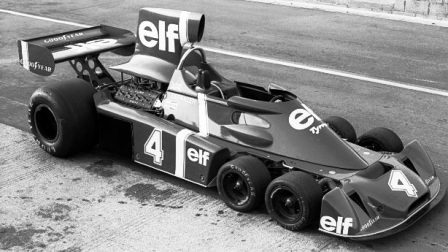 In the mid-Seventies almost every team on the grid (save Ferrari) was using the same Cosworth DFV engine, the same Hewland gearbox and the same Goodyear tyres, meaning that it had become extremely hard to find what Gardner termed ‘an unfair advantage’. Thinking outside the box, the designer revisited an idea he had first conceived while thinking up a way to improve the handling on Lotus’s four-wheel-drive gas turbine IndyCar of 1968 – a six-wheeled car.